I am clearly obsessed with tacos. I think it mostly comes out of my dislike of utensils but also they are quite handy and easily eaten. 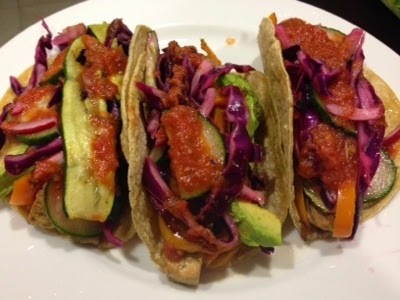 These tacos have grilled zucchini (courgette), grilled peppers, grilled onions, avocado, Cabbage Slaw, and tomato sauce. 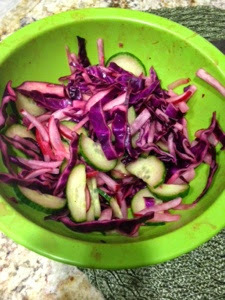 The slaw I made is my version of the slaw you can get at a taco truck. 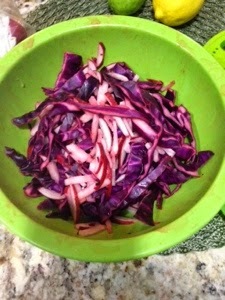 Chop cabbage into thin strips (or use as much cabbage as you want) and place in a bowl. Sprinkle with a pinch of salt and massage the salt into the cabbage- like you would for Sauerkraut. You don't want it to be too soft but just enough to break the cabbage down a bit. Julienne the radish (again use as much or little as you want) and add it to the bowl. Mix and massage the cabbage and radish together. Squeeze half a lime over the top, mix and let sit for 5 mins. Cut the cucumber in half length-wise then slice. Add to slaw with the other half of the lime juice. Mix and serve.